Q: Our historic Georgian home was clad in vinyl siding about 30 years ago, prior to our purchasing the house. In your July 2017 article, you discouraged the use of artificial siding, which is often considered in lieu of repainting. 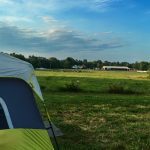 What can we expect to find if we remove the vinyl and what are our options for maintaining the house’s exterior? A: I’ll be honest: The words “artificial siding” make preservationists, and often local firefighters, cringe. For decades, asphalt, asbestos, aluminum, and, later, vinyl siding were widely promoted as cure-alls that would eliminate the need for painting and upkeep. But these promises have proved false as homeowners discovered that artificial siding can dent, deteriorate (due to the effects of UV light), crack, and fade. The material also traps moisture and can be a serious impediment to fire suppression when firefighters have to break through it to access wall cavities. At Maine Preservation, we advise homeowners to remove artificial siding, revealing the original wood, or replace the newer cladding with historically appropriate materials. This may require some financial planning and you may need to tackle the project in stages, but the results are worth it. Real estate studies show that well-maintained historic houses are more valuable and sell more quickly than buildings that have been “vinyled up” or insensitively amended. Here’s how to tackle the removal process. First, assess the condition of what’s behind your artificial siding. Because the material traps moisture, you may see evidence of water damage or rot. I always suggest looking on the north and east sides of the house first, as these are most often plagued by moisture issues. Remove a portion of siding and see if the original clapboards or shingles are still intact. Pay particular attention to the sections above and below window and door openings. Try to establish the general condition of as many areas as possible and be prepared for a few surprises. Window and door details, corner boards, and decorative trim under the eaves may have been removed when crews applied the new siding. These adornments will need to be reproduced, a simple task for a skilled restoration craftsperson with the correct molding planes. 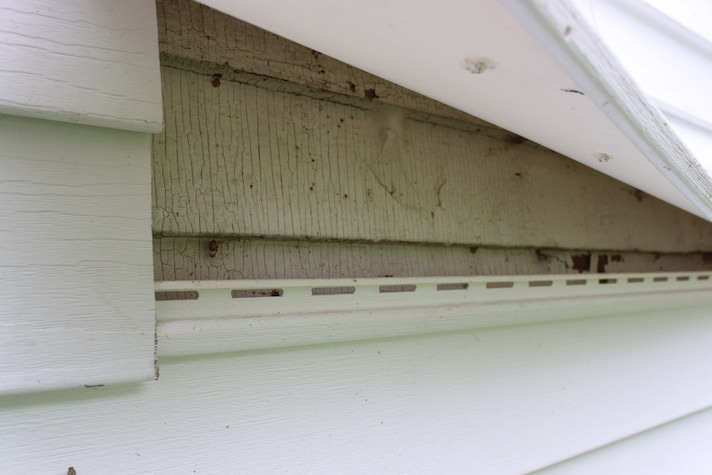 Next, determine the extent of the damage inflicted on the house’s original corner trim and cladding from screws fastening the channels that support the artificial siding. There’s good news here: the disfigurement may be unsightly but it’s no cause for concern. Most holes can be plugged with glue and epoxy and larger gouges can be filled with what carpenters call a “Dutchman”: a plug of wood fitted and glued into the marred area. Armed with a condition assessment and a general understanding of needed repairs, it’s time to get serious about your intentions. Still feeling hesitant? Remember that removing artificial siding dramatically improves a home’s appearance. You’ll instantly notice that the architectural character of the building has been restored. That’s because the shadow lines and details masked by artificial materials will again be visible. These are the points of interest that attract the eye and make a home look pleasing and “right” — as the original designer intended. The transformation is particularly striking on old clapboarded houses. I recently saw a 19th-century house where the visible height of each antique clapboard — known as the “reveal” — was 2 ½ inches. The artificial clapboards that had been placed over the originals had a reveal of 5 inches. The difference was remarkable. Vinyl siding with a wide “reveal” conceals narrower wooden clapboards in good condition. If your home’s historic clapboards remain in place, consider yourself lucky. The old-growth wood these are likely made of is more durable than what is available today and, unlike panelized artificial siding, you can remove and replace individual boards. The same is true with damaged shingles — simply swap them with new eastern white or western red cedar ones. (Cypress and Alaskan yellow cedar are also good options but markedly more expensive.) Follow our guide to repairing, prepping, and painting wood siding here and feel free to proceed with one wall at a time. This approach will be more affordable in the short run if you don’t have the dollars to tackle the entire project at one time. Many homeowners ask about replacing their original clapboards or shingles with new cement-based or composite materials. This may seem appealing because these products promise durability and less frequent repainting. However, they’re still relatively unproven materials and their longevity remains questionable. Additionally, improvements in exterior paints mean owners of wood-clad homes can now go 10–15 years before recoating. So my best advice is to stick with original materials wherever possible. Long story short: Removing artificial siding can reveal your home’s inherent beauty, improve moisture and ventilation problems, and provide resale rewards for you and your neighbors. Good luck and please contact us with additional questions. 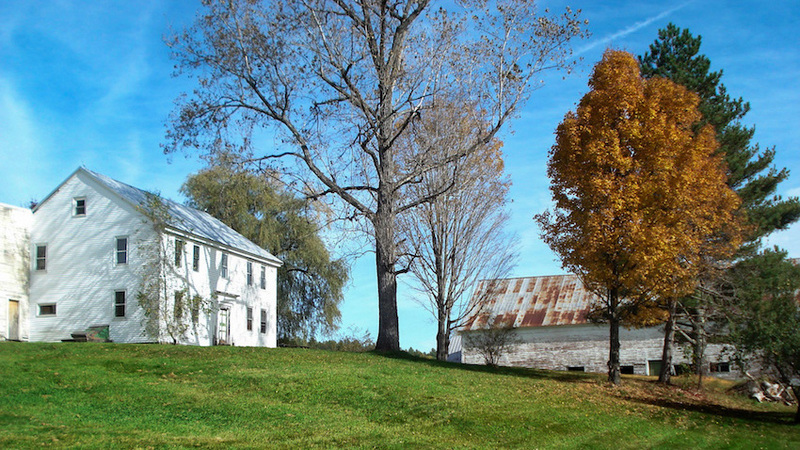 Cover image: The 1791 Abijah Buck House is one of the finest rural examples of the Georgian style in Maine. 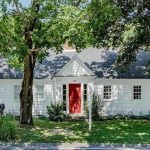 Still sporting its original clapboards, the home was constructed for a French and Indian War veteran and his wife, who settled the town now known as Buckfield.